This river has the biggest pothole(壺穴) area in HK. The lower stream is very famous for big pools, potholes and waterfalls, and more importantly, the lower stream is easily accessible. Therefore, many hiking materials rank this river as 2 stars. In this web page, we are going to bring you ONE step further to explore the hostile upper stream of PingJia river. This is the entrance of the PingJia river. You have to pass through some village neighbourhood before arriving here. There are quite a number of village guard dogs. Don't confront them. 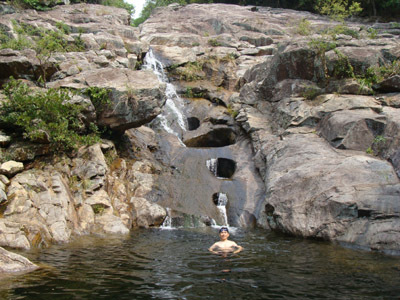 This is a waterfall at JiaLong Pool (嘉龍潭), it is about 35m high. This riverfall has several big potholes. Lawman is sitting at the second one. The bottoms of the third and the forth potholes are connected. Some hiking veterans said that the a slim person could swim from forth pothole to the third one. When this trip was taken, the tunnel between these two potholes has already been blocked by rocks. This is the close up of the third pothole, it is a natural big tub. Lawman is pointing at the forth pothole. This full view of JiaLong Pool (嘉龍潭) was taken from the height of the fifth pothole. Can you see concrete bridge in the upper part of this photo? This is first exit that you can leave the river. Normally, after enjoying the JiaLong Pool (嘉龍潭), people leave the river here. If you don't leave here, you will found a big dam shortly. There is a hidden and steep passage on the left of the dam. 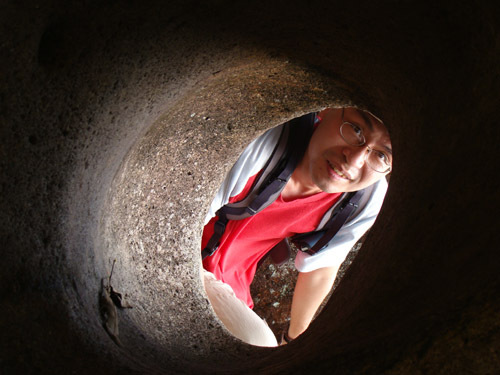 At 65M, you will find a very interesting rock with a big hole in it. This is Qiao Shan Bridge(僑山橋). This bridge marks the second exit of the river and the entrance of middle stream. You are now in the middle of no where, you could only find a small dam waiting for you. In the map, you might found an exit at about 250M. However, that exit may be too faint to be easily discoverd. The upper stream of the river is much more hostile than the lower stream. It is long and boring, it seems like you can never finish it. There are a couple of small pools and small waterfalls. Although small, those waterfalls are not friendly at all. That is one of the reason why I rank this river as 4 stars. As you go higher and higher, you will only find the river sneaking into dense vegetation. Your only hope is to look for the red ribbons for guidance. Hay! Here we go! At the exit of the river, you'll find a number of red ribbons (as shown in the picture) showing the exit of the upper stream. 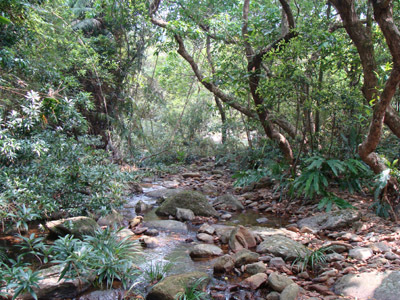 After another 30min of trekking in forest, you'll find yourself wind up in Wong Leng (黃嶺)! 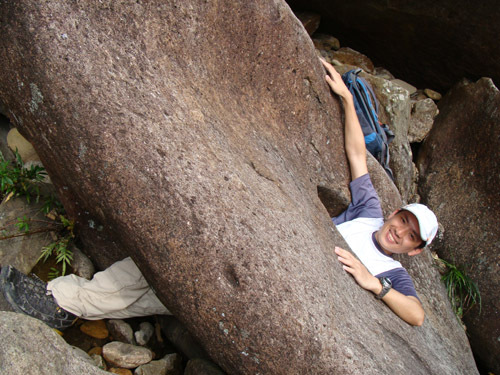 You climbed along a river to Wong Leng from sea level!! !